I had my first run-in with Black Twitter during my freshman year of college. While scrolling through the feed of my newly created professional account, I came across a tweet with the #BlackTwitter tag, joking about what it was like to go to an HBCU. Though I wasn’t enrolled in a historically black college, I followed that tweet to another, then another, and before I knew it, I’d spent an hour browsing through this newfound world. I found myself laughing along with tweets tagged #GrowingUpBlack and feeling inspired by #BlackGirlMagic stories. This was the first time, outside of my family, that I felt completely understood. And yet, when it came to liking or retweeting something, I couldn’t bring myself to do it. Life up until that point had followed a similar pattern. Being accepted into my top-choice college (which a high school friend credited to affirmative action) granted me the freedom to finally leave my problematic hometown for greener pastures, a private college 300 miles from home in a small town affectionately referred to as “ten square miles surrounded by reality.” While on paper my college wasn’t a paragon of diversity, to me it represented a whole new world. I had been one of only a dozen black students in my graduating class, and now I got to share a higher learning space with other people of color. It felt incredible. However, even in this new environment, I couldn’t escape the feelings of loneliness I thought I had left behind. Subconsciously I was distancing myself from campus initiatives and organizations specifically created for students of color. I didn’t feel like I deserved to be in spaces meant for me. Meanwhile, it was jarring to see other students of color who appeared comfortable with who they were and where they fit into the world because I had never felt that way before. While I had a reliable group of friends in high school, our school itself was anything but nurturing for a young woman of color. There was the time when my Advanced English teacher asked me in the middle of class if I “felt weird” being the only black student in the course. Any sympathy she might’ve been trying to convey only came across as pity, making me feel like she thought I belonged in a lower level class. Or the time when my drama teacher told me my prom date must have “jungle fever” for wanting to go with me. Or the time I went to my first high school party with a few friends. Shortly after we arrived, a white classmate from my grade walked up to me with a gray hoodie, the hood pulled all the way up, and laughingly asked if I found him offensive. I didn’t understand what he meant at first, but then it clicked. Trayvon Martin had recently been murdered. I don’t remember saying anything, but I do remember feeling consumed with a helpless rage. I took all of these moments in stride—in fact I felt an obligation to do so. The few times I did speak up, I was laughed off, and being personally offended did nothing but make me feel pathetic. The one time I tweeted out my frustrations, I was met with radio silence. I figured my best bet was to put up a humorous front both on Twitter and in school and shove my real feelings to the side. By rolling with the punches, I thought I came off as more likable and agreeable. I thought this was the only way to keep the friends I had worked so hard to have. These memories and others came rushing back to me during that first run-in with the Black Twitter community. After hiding my real opinions and experiences for the past few years, it was equal parts uplifting and shocking to see other people openly share these parts of themselves. I never knew something as simple as Twitter could foster such a powerful space for action and inspiration. 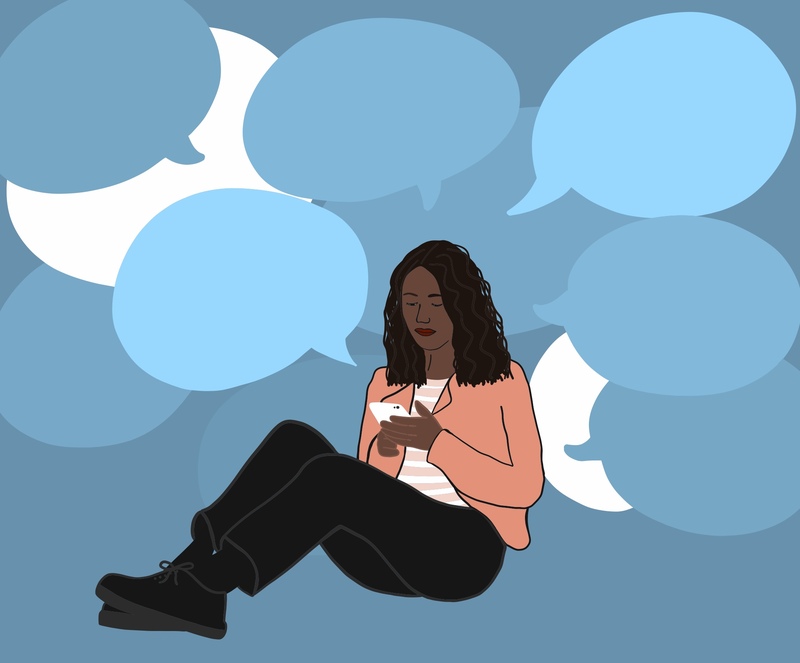 In 2013, Feminista Jones, an author and outspoken community activist, wrote about Black Twitter for Salon, describing it as a modern-day “grass-roots communication” tool for African Americans to achieve change in their communities. Jones likened it to the way African slaves first developed alternative methods of communication as a survival tool. Black Twitter’s ability to effect real change was not lost on me. A movement that always stuck out to me was how #BlackGirlMagic grew from a hashtag into a source of inspiration that sparked the birth of empowering organizations and campaigns. As I watched Black Twitter develop hashtags to spark action or make headlines for its reaction to pop culture events, my love for this e-community grew. However, that feeling of belonging continued to escape me. Despite all of the good Black Twitter was bringing about, I could not help but turn my own feelings of inadequacy into a wall. Without knowing it, I had become terrified of coming across as inauthentic or fake in the eyes of others. All those years of blocking myself out of my own community had blinded me from realizing I was the sole person responsible for my own suffering. These wheels of self-awareness were first set in motion when I came across a tweet from activist DeRay Mckesson. Periodically he tweets out the phrase, “I love my blackness. And yours,” to his large Twitter following, and one day that tweet happened to reach my feed. Immediately, it struck a major chord. I was more confused than anything else—what did he mean by loving his blackness? Why was he phrasing blackness as a concept? While I had never felt ashamed of my blackness, I didn’t treat it as something warranting love or anything other than indifference. Instead it was one of the many traits that made me who I was, and nothing more. This way of thinking began to take over my worldview. Not a day went by where I wasn’t thinking about my blackness and how I had been treating it as something others judged at face value instead of the personal quality it actually is. In my head being black was both my race and something others could discredit me for if I didn’t behave a certain way. These feelings of mediocrity had completely taken over my life, and it took a tweet celebrating blackness for me to realize that. The frightened teenager who didn’t know how to fight back or properly love herself was not the person I wanted to be anymore. As college came to a close, I began to treat Black Twitter as a tool for changing myself. It was too late to join any clubs, but my baby steps came in the form of liking and retweeting Black Twitter content as I came across it. The “backlash” I had spent so long fearing didn’t exist—if I was lucky I got a like or retweet in response to something I posted. While social media has its good and bad sides, this community was the push I needed to start living my life as authentically as possible. It also pushed me to revisit my high school experiences and see how harmful they really were. While I can’t go back in time to call out the teachers and classmates who did the most damage, I now enter conversations about race, both on and offline, without fear. To the English teacher, the drama teacher, the classmate at the party, and all of the other students and instructors who said insensitive things: Your words were more damaging than you realized. Let’s talk about it. This space inspired me to challenge my idea of what loving myself meant. I decided that I am allowed to voice support for causes and movements without being afraid. I am allowed to retweet jokes about growing up in a black household, and to share stories of black excellence and inspiration. Now sharing content I come across is no longer an inner battle of feeling obligated to show support for my community, or fearful of how I could come across. Black Twitter is unapologetically black, just like me.